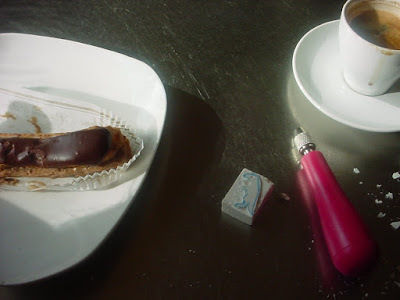 Meet up with (preferably equally crazy) friends to go letterboxing. 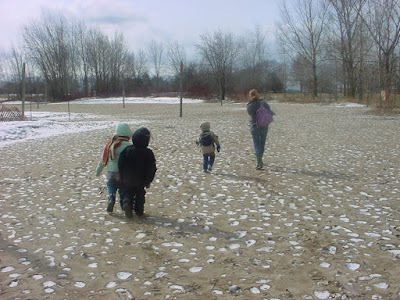 Walk along a frozen Lake Ontario beach on a blustery February day following clues for said letterboxing. Have great adventure following clues. Rejoice with frozen tears of joy upon finding sought after spot. 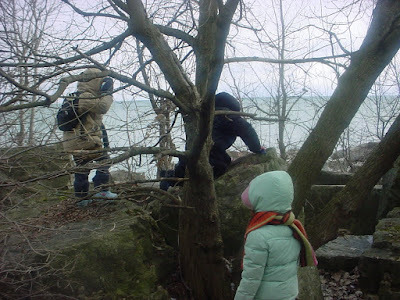 Have small children laugh at you while you try to retrieve small box from rock crevasse by gamely wedging your body down into a tree, head-first. Realise that there's not too much disappointment in the air because 1) kids really do like the hunt, and 2) kids are frozen. 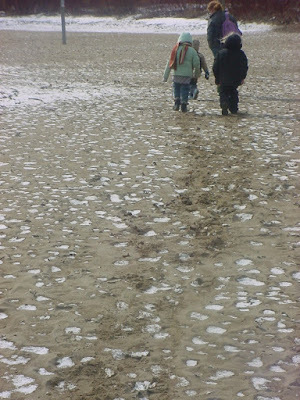 Retreat to restaurant (after a gasping-from-the-wind walk back around a small bay, a far-too-quick run for a bus, and another short-but-seems-long walk, fixing scarves and hoods and mittens continuously en route) and reward wonderful children with waffles, french fries, and icecream. Watch children create weird maple-syrup/water/apple juice/ketchup/pepper/vinegar/salt/sugar concoction. Laugh with friend. Wait for warmer weather. It really is nice of you to leave it at equally crazy. In reality we may win hands down. I did take the baby on that adventure after all. What super day you'd had - tempting me to home school even more!! Nice day. 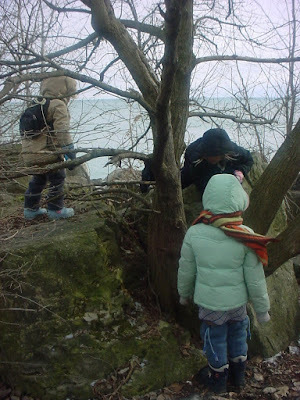 We do Geocahcing which is a bit like letterboxing. Wonderful. Way to go with the flow! sounds like a wonderful day! and the stamps look like fun. I thought we were the only people crazy enough to letterbox in the freezing cold. Then again, we are homeschoolers and aren't we all a little nuts by definition? Found this post via Twitter, you sound like a kindred spirit. Thanks for the cute post!